At 42 North, like most brewers, we take care to purchase fresh and well cared for hops for all of our beers and then keep them sealed and as cold as possible. The enemies of a hop’s volatile, flavor-rich hop oils and bittering acids are heat and oxygen. Recently we threw that book out the window and purchased 300lbs of 6 year-old hops to purposely age them warm and unsealed for the next year or more. This is a step taken for brewing only a few beers around the world and results in “aged” hops. The aging process creates oxidized oils and acids that maintain some earthy or herbal character and provide some antimicrobial properties to help inhibit certain bacterial growth. As opposed to a fresh hop, aged hops provide a less apparent, dull bitterness. Last month we received 300lbs of Pride of Ringwood hops harvested in Australia in 2012. Traditionally, aged hops mostly consisted of soft, European “noble” varieties like Saaz, or Tettnanger but availability of 6 year-old hops is somewhat limited. The Pride of Ringwood hop is the daughter of these varieties and has a nice oak, cedar, and herbal character that should be perfect for our future plans. 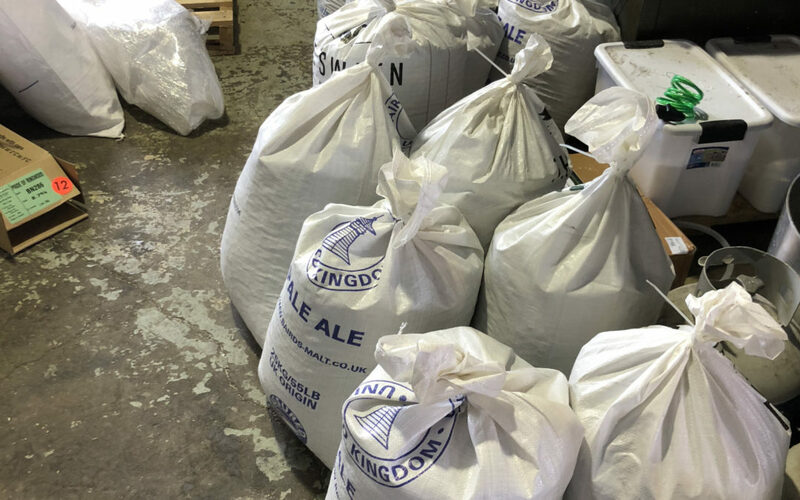 We transferred these hops into empty, permeable grain bags to allow oxygen to flow through the hops and plan to find a warm, dry home for them for the next year or so. When the time is right in 2019, we plan to use these hops for a coolship produced wild, sour ale. The resultant beer will be available sometime in 2020.